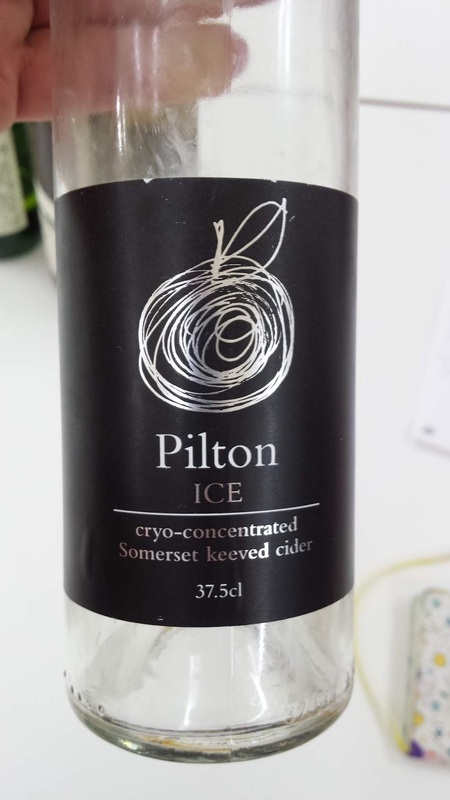 Is it just me, or does everybody think of the Piltdown Man when they see a bottle of Pilton? Just me? Right. Fair enough. This empty bottle held a most rare, and most tasty, liquid. 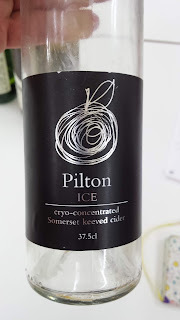 Britain doesn't have the right climate to permit cider makers to make ice cider al fresco, so there's a good deal of faffing about with chest freezers, not to mention the difficulty of pressing frozen apples, or, as has happened in this case, the freezing and slow careful thawing of already pressed juice. The result is delightful. Colour is a vivid red amber. Not quite copper. Vivid and beautiful. The nose is very earthy. It seems tannic - so I guess it's making me think of apple skins. Mossy sticks. Spices and apple skins. Herbal? Aye, herbal, green-grey, lichen on stones . It's a fascinating herbiness. Grey-green, but not as sweet as sage. The taste is tangy sweet, but with drying tannins. Earthy again. Vivid fruit acidity. Red fruits. Dark. Not yellow. Perhaps some green gooseberry acid. The tannins are very gentle. There's some bitterness in the finish, but it serves to balance the intense sweet attack. A delicious, complex drink. I'd class it as Outstanding. Can I have some more please?